This is a strange blog post, even by the high standards of weird I’ve set by taking pictures of brass dodo birds and ceramic shoes. It may also be boring, but I’m already more than an hour into day 22 and need to put day 21 (and myself) to rest. I just put three types of scones—six discs of dough to bake in the morning—in my refrigerator, and I was thinking about all the stuff that I had to navigate around in order to fit them in there. Half a pomegranate in a large measuring cup, because I was too lazy to find another container. A lot of Crisco. Two cans of Reddi Whip, which I’ve been putting on just about everything lately. Many strange condiments, mostly from Trader Joe’s. About a billion cans of Diet Coke. Kozy Shack rice pudding in little cups. I’m always kind of fascinated by the contents of other people’s refrigerators, even by the highly stylized ones on cooking shows that are somehow supposed to look comfortable and homey—“oh, out of everything again except for six lemons and six bottles of San Pellegrino?” Is that just me? Maybe. Off to bed. wow…. 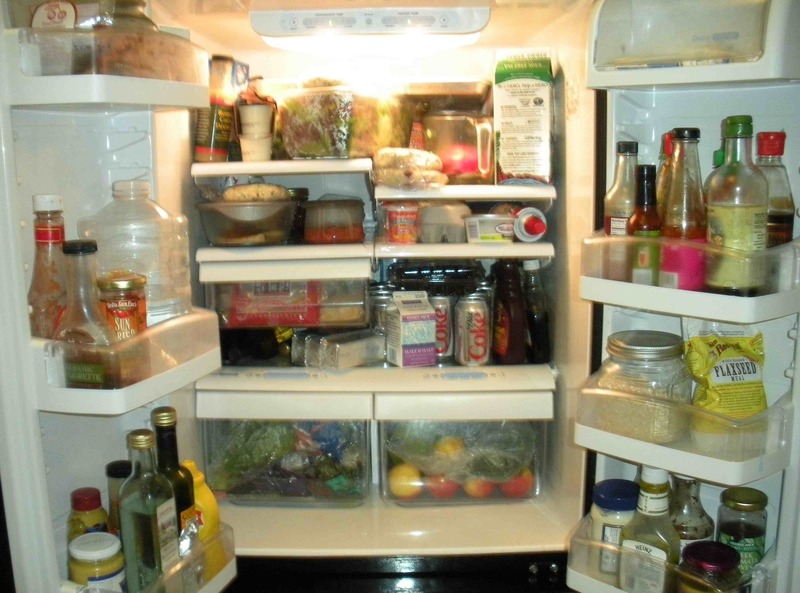 i am going to have to take a photo of my fridge for you. it looks like a barren desert in comparison. And you always say I’m a hoarder: only you could fill a fridge that big whilst living alone. Where would poor Ricky keep his 3/4 empty soda cans? this looks like heaven. our fridge is only that full about once every couple of months. I know. It’s totally crammed. Mostly because I have the world’s largest box of mixed greens on the top shelf, and a truly ridiculous amount of Diet Coke—so much that it actually made more sense to store it in the fridge than to try to find another spot for it in my dollhouse. I think that’s a bad sign, when the fridge seems comparatively spacious. Do you like that double door freezer drawer fridge? It seems ideal to me. That’s what we’re getting. Our fridge is mostly condiments, diet coke, beer, and various tubs of dairy products like cottage cheese and yogurt. And also stacks of actual cheese. And wilted vegetables that I never had time to cook in the drawers. Somehow, I think having a new kitchen is going to make me start cooking again in February. It’ll actually work if they pass health care legislation around the same time!! !